This post continues a series examining the prophecy of Genesis 9:25-27 and the three sons of Noah. “My Three Sons” introduced the passage and its setting; “Canaan and the Curse” focused on Noah’s prophetic curse on Canaan, the son of Ham. “He also said, ‘Blessed be the LORD, the God of Shem; and let Canaan be his servant’ ” (ESV, Gen. 9:26). Leaving the prophetic curse, Noah began to issue two “blessings”—a spiritual blessing on Shem and a temporal blessing on Japheth. Actually, it was not Shem himself who was blessed, but He who would eventually be the God of Shem (i.e., the LORD). Our English versions indicate by the four capital letters of LORD that the word used for God’s name is the sacred personal name sometimes translated “Jehovah,” but probably more accurately pronounced “Yahweh.” It is God’s covenant name, indicating His eternal existence and His personal relationship to His covenant people. It is the LORD (i.e., Yahweh) who would be the God of Shem and his descendants. 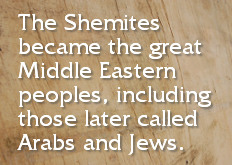 The Shemites became the great Middle Eastern peoples, including those later called Arabs and Jews. What this prophecy indicates, therefore, is that God would establish a personal covenant relationship with the line of Shem. The family descendants of Shem are listed as part of the “Table of Nations” in Genesis 10:21-31. What is most important to notice, however, is that from Genesis 11:10 through the Revelation the biblical account deals almost exclusively with Shem’s descendants. Genesis 11:26 introduces us to Abram, a “Shemite,” and it is with this man that God made a special covenant that formed the basis for all of His later dealings in salvation history. How marvelously did Noah’s prophecy find fulfillment in later biblical history! Let us briefly trace this amazing development. In Genesis 3:15, the promise was given that the ultimate deliverance from Satan would come through the seed of a woman. Here, in Genesis 9:26, the promise was narrowed to one branch of mankind—the line of Shem. In Genesis 12:1-3, the promise of a Messiah-King was narrowed to one of Shem’s descendants, Abraham. The promise was then channeled through Abraham’s son, Isaac (Gen. 21:12) and then through his grandson, Jacob (Gen. 28:13-15). Finally, the family tree of Genesis is traced through Jacob’s son, Judah, and his descendants (Gen. 49:10). Years after that, the promise was narrowed to one within the tribe of Judah named David (2 Sam. 7:4-17). Finally, these and many other prophecies found their remarkable fulfillment in one individual—Jesus of Nazareth, descendant of David, Judah, Abraham and Shem (see Lk. 3:23, 36)! Again, Noah’s prophecy proved to be far-reaching and provided another link in the unbroken chain of redemption centering in the Messiah—the hope of Israel and the Savior of the world.